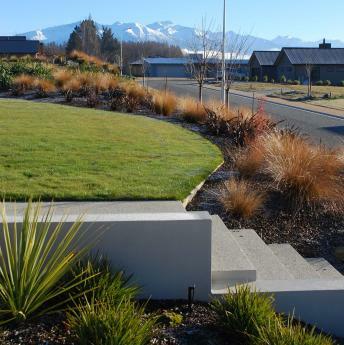 Maintaining the expansive mountain views of this property was a must for the client, however, shelter from the wind and privacy were also important considerations. To achieve both these requirements a walled courtyard was designed to a height that allowed the mountains to be viewed, whilst the road and houses were screened. Windows are created within these walls with shutters, which can be opened on a still day and emphasise and frame mountain vistas. Subtle, naturalistic mounding along the street frontage screens the road from the garden which wraps around a large central lawn area with park like specimen trees for splashes of autumn colour and summer shade. Both native and exotic plants have been used in combination to create year round interest in the garden.